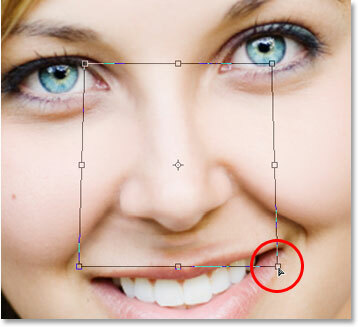 In this Photo Retouching tutorial, we're going to learn how incredibly easy it is to give someone a digital nose job (not that anyone we know would need it, of course!). 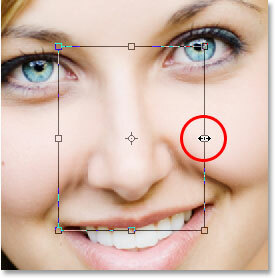 This photo editing technique is so simple and easy, you'll be tempted to use it on photos of people who honestly don't need it. Or at least, that's what you can tell them when they ask you why you made their nose smaller. You simply had to because it was so much fun and so easy to do! Seriously though, let's face it, sometimes photos don't do people justice, and even though in real life their nose may be a textbook example of what a human nose is supposed to look like, a wrong focal length setting on the camera lens, bad lighting or an unflattering angle can distort reality and make things look bigger than they really are. Fortunately, Photoshop makes digital plastic surgery a breeze without the need for any fancy surgical tools or even a steady hand. In fact, all you need is the Lasso Tool, the Free Transform command, and the Healing Brush to clean up any rough spots. 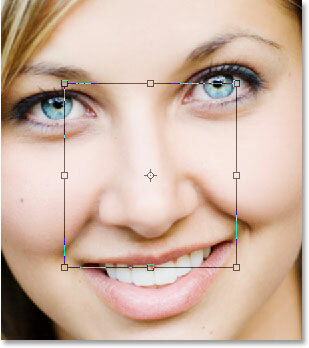 Use Photoshop's Lasso Tool to draw a rough selection around the nose. It's definitely better to select too much of an area than not enough, since we'll be cleaning things up at the end. Feather the selection to make the edges softer. Click OK to feather the selection and exit out of the dialog box. 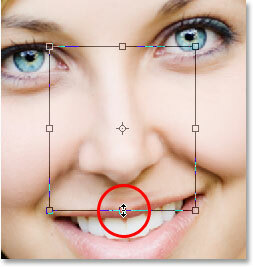 Press "Ctrl+T" (Win) / "Command+T" (Mac) to bring up Photoshop's Free Transform box and handles around the nose. 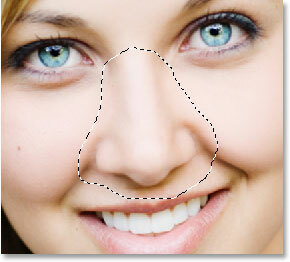 Drag the side handles in towards each other to make the nose thinner. Hold down "Alt" (Win) / "Option" (Mac) as you drag one of the handles to tell Photoshop to drag the opposite handle in at the same time. 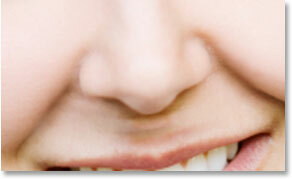 Shorten the length of the nose by dragging the bottom handle upwards. Hold down "Alt" (Win) / "Option" (Mac) to have Photoshop drag the top handle downwards at the same time as you drag. Press Enter (Win) / Return (Mac) when you're done to accept the transformation and exit out of the Free Transform box. The shadows under her cheeks no longer run in smooth, continuous lines but appear broken. The problem with the shadow lines under her cheeks is now corrected. Once again I'll press "Enter" (Win) / "Return" (Mac) to apply the transformation and exit out of the Free Transform command. The area under her nose needs to be cleaned up. 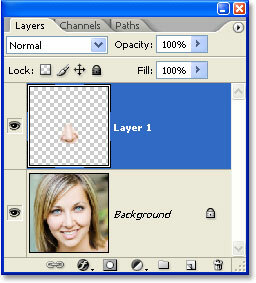 Click on the "New Layer" icon at the bottom of Photoshop's Layers palette. Photoshop adds a new layer at the top of the layer stack and names it "Layer 2". Select Photoshop's Healing Brush from the Tools palette. Select "Sample All Layers" in the Options Bar. You'll need this option selected whenever you're using the Healing Brush on a separate layer as we're doing here. The Healing Brush works by sampling the color, tone and texture from part of the image but since we're working on a new blank layer, there's nothing on the layer for the Healing Brush to sample. By selecting the "Sample All Layers" option, Photoshop is able to sample from not only the layer we're on but also from any layer(s) below it, which is exactly what we want. 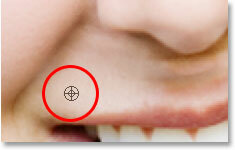 With the Healing Brush selected, hold down "Alt" (Win) / "Option" (Mac) and click on a good area of skin to sample it. Make sure you sample from an area close to the area you're trying to heal to keep the skin texture as similar as possible. Then, with my first area sampled, I'll release my "Alt/Option" key and begin clicking on areas under her nose that need to be cleaned up. You'll see your cursor change back into the brush cursor when you release "Alt/Option", letting you know that you're healing areas of the image at this point rather than sampling from them. Again, I'll click with my mouse rather than paint with it, since painting large areas with the Healing Brush tends to give Photoshop too much information to work on at once and usually gives you poor results, so it's best to click instead of paint. I'll click on a few spots to clean them up, and as I do, Photoshop replaces the texture from the area I clicked on with the texture from the area I sampled. It also tries to blend the color and tone from the area I sampled with the color and tone of the area I clicked on. 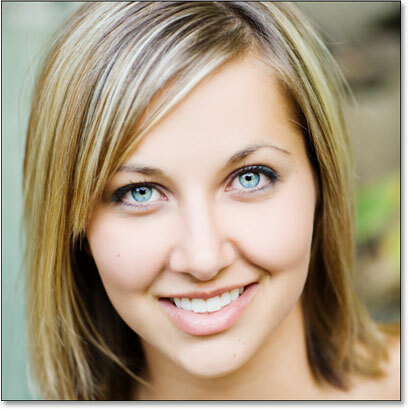 This replacing textures and blending colors and tones is what Photoshop calls "healing". If I continue clicking on areas to heal them using that exact same area I sampled from though, the area under her nose is going to end up looking like a repeating pattern, which is a dead giveaway that the image was retouched. To avoid turning her skin into wallpaper, I'm only going to click on a few spots to heal them and then I'll hold down "Alt" (Win) / "Option" (Mac) and click on a different area of good skin to sample it. Then, with the new area sampled, I'll release my "Alt/Option" key and click on a few more spots to heal them before sampling from a different area again, repeating this process of sampling and healing, sampling and healing, over and over until the area under her nose looks good. Continue sampling from different areas of good skin by holding down and using them to heal problem areas until the area under the nose looks natural. 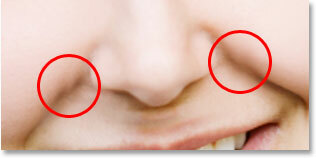 Keep in mind that in most cases, you won't be after a Michael Jackson-sort of drastic nose job. You'll usually want to keep things more subtle, and if you're lucky, the person in the photo won't even realize what you've done. If they think they look great in the photo and have no idea what sort of work you put into it to make them look so good, then consider it a compliment to your Photoshop photo retouching skills and a job well done!